Anything created or originally developed by monks is fair game: Benedictine, Champagne, Chartruese, Trappist Ales, or any other odds and ends your research turns up. 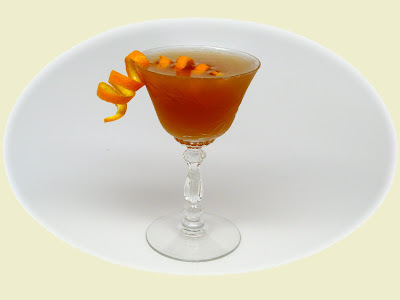 Shake and strain into cocktail glass; squeeze orange twist spraying oils over surface of drink, garnish with orange spiral. Splash absinthe into coupe glass, shake and strain rest into glass; garnish with orange spiral. Dale DeGroff notes in his book The Essential Cocktail that there is an alternative Americanized version that subs Bénédictine for the Absinthe, so there's actually another tidbit that makes one version of the Monkey Gland a little monky itself.